Zelda coming to the Wii U? A few games are already being mentioned to be coming to Nintendo’s next home console the Wii U: Tekken Wii Successor, Darksiders 2, Batman: Arkham City, a new Assassin’s Creed, Ghost Recon Online, and Ninja Gaiden, just to name a few. 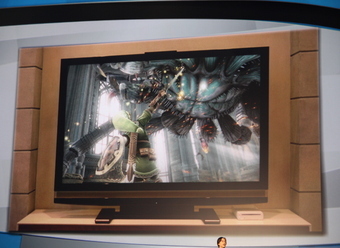 A Zelda and Mario game was also shown while demonstrating the controller. EA is also showing a lot of support from Nintendo and suggests how a Battlefield game on the Nintendo console could be enhanced by the new system’s capabilities. It was also teased that Super Smash Bros. will be coming to both the Wii U and the 3DS and that the two versions will have some sort of connectivity. LEGO City Stories will also be making its way to to the Wii U. It will have open world elements as well as the usual humour we’ve come to know and love in the LEGO games. if they made a zelda to be pretty awesome i mean they showed it at e3 gotta mean sumtin right? The games mentioned are OK, but I’d like to see more first-party games and it would have been great if they had a more organized presentation instead of just announcing stuff. Both the Mario game shown and the HD Experience Zelda tech demo where just that demos one to show case the HD resolution, lighting, shadow, and particle capabilities of the console and the other to show case some play style ideas Nintendo is thinking of using. Outside Pikimin 3 currently we have no idea what games Nintendo is producing for this console.